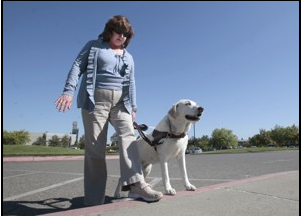 Silent electric cars, bicycle commuters, double-wide baby strollers—guide dogs face more distractions than ever, but the folks training them are up on all the challenges and teaching the new generations of guide dogs how to cope with the latest distractions with ease. This entry was posted on Tuesday, September 13th, 2011 at 4:01 PM. It is filed under Blog. You can follow any responses to this entry through the RSS 2.0 feed.